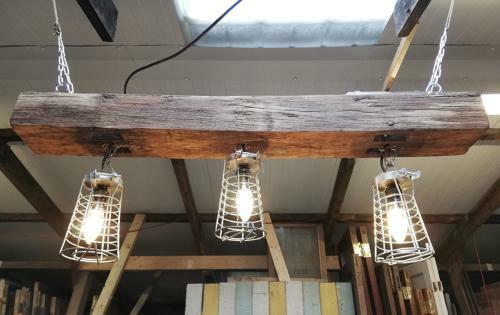 A fantastic industrial style hanging ceiling light made using a beautiful reclaimed oak beam with three reclaimed mechanics cage lights. The lights are suspended below the beam, spaced equally, with a bulb in each. The beam is currently hung using metal chains but purchaser could replace these with thick ropes, depending on the look desired. The light would look wonderful suspended over a dining table or within an industrial style space or business. The lights have been rewired and are working, see picture, however PURCHASER MUST GET THE LIGHT TESTED by your electrician BEFORE use. The light at present has been put on a normal 3 pin plug but will, we assume, need to be wired in to the lighting circuit and should be tested at this point by your fitter. The light has been made recently using reclaimed materials and therefore has some character signs of use and wear. The beam has some surface cracks and splits and some slight colour variation. There are some light marks and tarnish to the metal cages. The light is a very fashionable and desirable item and has a lovely industrial look.